Flinder's vase Vasum flindersi, from here. The Turbinellidae, chank and vase shells, are a group of generally large gastropods with a thick, spindle-shaped shell (the largest known gastropod, Syrinx aruanus, belongs to this family). They possess a long, thin proboscis that folds into a non-evaginable proboscis sheath (Harasewych & Petit 1989). [BW09] Bryce, C., & C. Whisson. 2009. The macromolluscs of Mermaid (Rowley Shoals), Scott and Seringapatam Reefs, Western Australia. Records of the Western Australian Museum Supplement 77: 177–208. [DK10] Darragh, T. A., & G. W. Kendrick. 2010. Eocene molluscs from the Merlinleigh Sandstone, Carnarvon Basin, Western Australia. Records of the Western Australian Museum 26 (1): 23–41. [ES88] Emerson, W. K., & W. E. Sage III. 1988. A new species of Vasum (Gastropoda: Turbinellidae) from off Somalia. Nautilus 102 (1): 36–39. [H89] Harasewych, M. G. 1989. 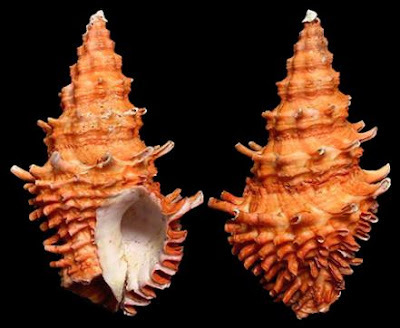 A new species of Coluzea (Gastropoda: Turbinellidae) from off southeastern Africa. Nautilus 103 (2): 70–72. [HP89] Harasewych, M. G., & R. E. Petit. 1989. The nomenclatural status and phylogenetic affinities of Syrinx aruanus Linné, 1758 (Prosobranchia: Turbinellidae). Nautilus 103 (2): 83–84. [PH90] Petit, R. E., & M. G. Harasewych. 1990. Catalogue of the superfamily Cancellarioidea Forbes and Hanley, 1851 (Gastropoda: Prosobranchia). Nautilus Supplement 1: 1–69. [RA75] Radwin, G. E., & A. D’Attilio. 1975. A catalogue of muricacean generic taxa. Transactions of the San Diego Society of Natural History 17 (20): 279–292. [WG71] Wilson, B. R., & K. Gillett. 1971. Australian Shells: illustrating and describing 600 species of marine gastropods found in Australian waters. A. H. & A. W. Reed: Sydney.